Rapture game led pack at Bafta awards Jump to media player An indie title - Everybody's Gone to the Rapture - won three times at the Bafta video games awards, but missed out on the top prize. Fallout 4: Bafta win 'unexpected' Jump to media player US games developer Bethesda is caught by surprise as it wins 2016's best game prize at the Bafta awards. Doom creator honoured with Bafta Jump to media player The creator of Doom, Wolfenstein 3D and Quake is honoured with a Bafta fellowship at the academy's games awards. Dara O Briain on Bafta games awards Jump to media player The host of the Bafta games awards discusses some of the titles nominated at 2016's ceremony. AI-powered deer rampages through GTA V Jump to media player A computer-controlled deer is causing chaos in a modded version of the violent game Grand Theft Auto V.
PlayStation VR headset undercuts rivals Jump to media player Sony reveals its forthcoming virtual reality headset will be significantly less expensive that Facebook and HTC's rival kit. Tom Clancy's The Division reviewed Jump to media player BBC Click's Marc Cieslak gives an early review of the online, third-person shooter Tom Clancy's The Division. 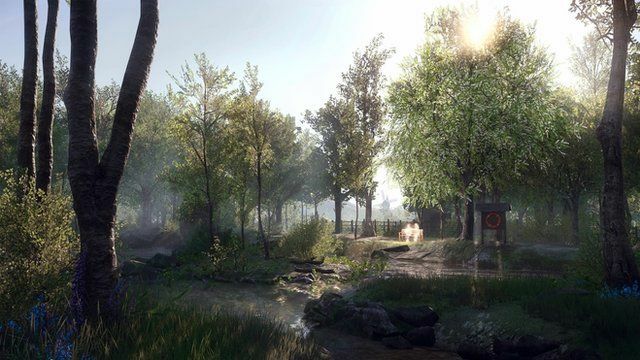 An indie title - Everybody's Gone to the Rapture - won three times at this year's British Academy Games Awards. It walked away with the game innovation, music and performer prizes. However, it missed out on the top award - best game - despite having had 10 nominations, the most of any title. The developer, Brighton-based The Chinese Room, has created a quirky experience that involves the player trying to find out what happened to the inhabitants of an abandoned English village. Ahead of the ceremony, the Chinese Room's co-founder Jessica Curry explained its appeal to the Today programme's John Humphrys.